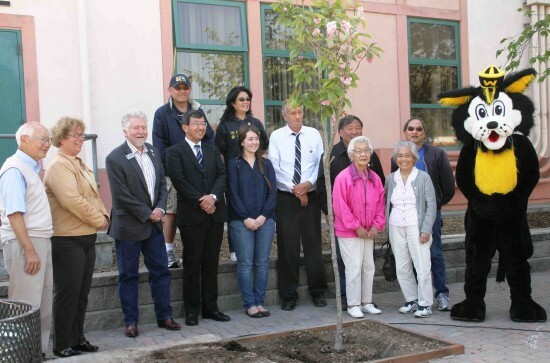 The sakura tree was dedicated at Watsonville High School last April with school and city officials in attendance. Mas Hashimoto is on the left and Willie the Wildcat, the school mascot, is on the right. WATSONVILLE — A young sakura (cherry tree) planted at Watsonville High School as a token of appreciation and friendship last spring was broken by vandals on Sept. 8, and the crime remains unsolved. The Santa Cruz Sentinel reports that surveillance footage shows boys yanking the tree back and forth until the trunk snapped, but that no one has been identified or arrested. It was not clear if students were responsible. “It’s beyond me why someone would want to damage it. I was shocked,” said Principal Elaine Legorreta. The planting ceremony was inspired by the centennial celebration of the cherry trees that were presented by Japan to Washington, D.C., in 1912 as a symbol of friendship and still bloom today. Sakura were also planted in Watsonville in the late 1920s as a gift to the city from the Watsonville Japanese Association, but most of those were cut down during World War II. One of the surviving trees was located outside Hashimoto’s classroom at WHS. He also remembers seeing the tree as a student in the early 1950s. After it died, the local JACL chapter donated a new one to replace it. Deputy Consul General Nobuhiro Watanabe, who is now acting consul general in San Francisco, was among the dignitaries who participated in the ceremony. Two pre-war graduates of WHS, Nancy Tada (1933) and Kitako Tsuda Izumizaki (1940), also attended. Hashimoto, who taught at WHS for 36 years, suggested that a fence be put up around what remains of the tree to protect it from more damage, and that a storyboard explaining the tree’s significance be added. Watsonville Mayor Lowell Hurst condemned the vandalism but was also critical of the school. “It is beyond sad that the school cannot protect a special ceremonial gift tree,” he said. “Certainly the danger was not unknown or unanticipated as many trees have been planted and destroyed by vandals, bad construction practices, and neglect at this school site and others. It was my understanding at the planting ceremony that some protective fencing or temporary barrier was to be installed.